Nobody told us about this publication: Talking Buenos Aires. 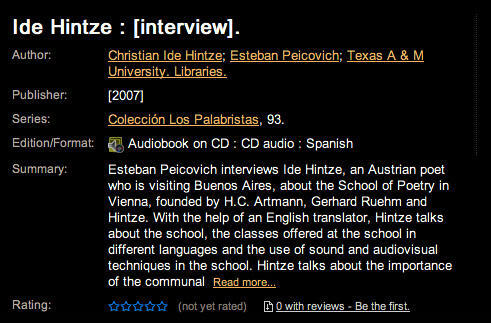 Esteban Peicovich interviews Ide Hintze. Audiobook on CD. Texas University, USA 2007. "Esteban Peicovich interviews Ide Hintze, an Austrian poet who is visiting Buenos Aires, about the School of Poetry in Vienna, founded by H.C. Artmann, Gerhard Ruehm and Hintze. With the help of an English translator, Hintze talks about the school, the classes offered at the school in different languages and the use of sound and audiovisual techniques in the school. Hintze talks about the importance of the communal aspect of the poetry that got lost through time in Europe and how the incorporation/use of those media could help in the re-union of the lost elements in poetry. The interview ends with Hintze talking about his impressions about Buenos Aires and reading 2 poems in German. Peicovich also reads the Spanish version of Hintze's poem, Rebelión de los vecinos desconocidos."